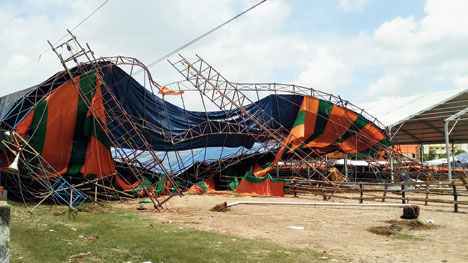 Midnapore: A Bengal forensic team on Tuesday visited the Midnapore College Grounds, the venue of Prime Minister Narendra Modi's rally on Monday, and found several deficiencies in the way the temporary structures were erected. Two shamianas had collapsed on Monday - one during the rally while Modi was speaking and the other five hours after the meeting ended. "The two shamianas were not set up properly. Their pillars needed to be tightened with four nuts each but they had only one nut each. This was dangerous negligence," said Chitrakkho Sarkar, head of the physics department in the State Forensic Sciences Laboratory. "The metal scaffolding was rusty and the welding came off in some places," Sarkar said after inspections and collecting samples. Police have called for questioning the agency that had installed CCTVs after it was found that the cameras were not working. Sources said the team had sent its preliminary report - mentioning how a weak structure had collapsed on the soggy ground - to Nabanna. "The report mentioned that the pillars were put up by digging only three-to-four-foot holes but to hold such big structures, the base of the scaffolding should have been deeper," said an official. As the state BJP had organised the rally, the onus of the weak structure lies on it, the official added. "The state government does not see any fault on the part of the PWD as the SPG had taken over the major portion of the ground seven days prior to the event," said a source. A team from Delhi - comprising S.K. Sinha, secretary (security), and Arti Bhatnagar, joint secretary, both from the cabinet secretariat - will inspect the venue on Wednesday. The team held a series of meetings on Tuesday. Sources said state officials told the Delhi duo about "advance warnings" to cover the entire ground with tarpaulin sheets or leave it uncovered. "When it rains, people try to seek cover. That's what happened. They had covered 60 per cent of the ground and left the rest uncovered," said a senior Bengal police officer. The officer also claimed to have provided crowd alerts. "We had told the organisers that the crowd should not exceedthe venue's 70,000 capacity. But at least 1.25 lakh people came," said the officer. A Bengal forensic team on Tuesday visited the Midnapore College Grounds, the venue of Prime Minister Narendra Modi's rally on Monday, and found several deficiencies in the way the temporary structures were erected.